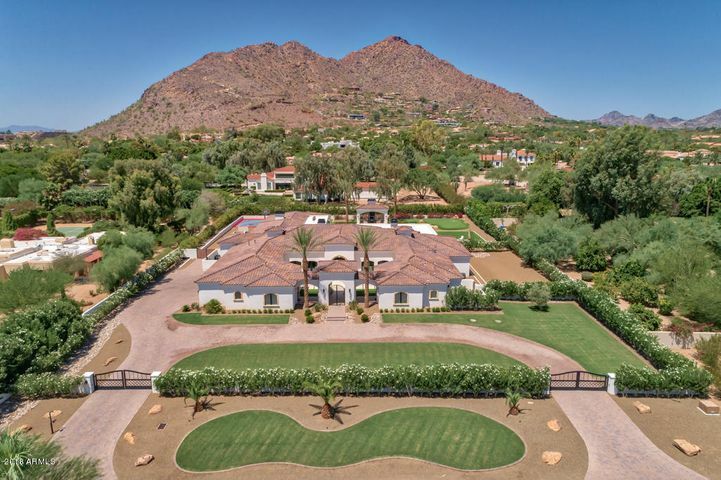 This 2017 privately gated 6 bedroom,7 bath,9,490sf Transitional 1.36 acre estate,with 2 guest suites,is located on one of the most prestigious streets in Paradise Valley.The heart of the home is an impressive dual island chef's kitchen with Wolf and Sub-Zero appliances. It flows into the family room creating 70 ft of uninterrupted open living space. The family room's full entertainment bar also services the adjoining 12 seat home theatre. Multiple motorized pocket doors open to a huge, green backyard pastureland with sport court, putting green, resort-size pool steps away from a ramada with fireplace, a BBQ area and covered entertainment patios.